Oxford Film Festival Take 5 With...: Animation Show 3: Get Your Own! Animation Show 3: Get Your Own! A highlight of the 4th Oxford Film Festival (2007) was definitely The Animation Show 3. Many were disappointed that we were unable to show the AS4 in our 2008 festival, but unfortunately, it just wasn't ready in time. However, we still hold out hope that we will be selected for the upcoming tour. 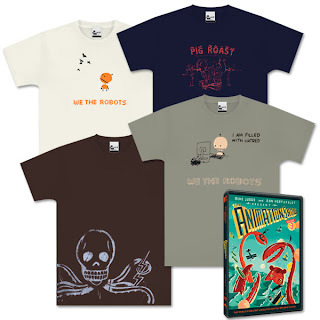 In the meantime, you can get your own copy of the Animation Show -- as well as some super cool merch -- by shopping at the Animation Show's Official Webstore. The Volume 3 DVD includes favorites from the 2007 theatrical show such as Bill Plympton's "Guide Dog" and Don Hertzfeldt's "Everything will be OK" and a special appearance by Beavis and Butthead. Also included is Nieto's experimental "Carlitopolis!" 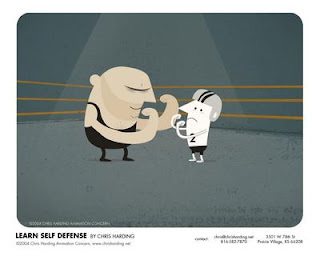 and Chris Harding's "Learn Self Defense" (Winner, Best Animation, 3rd Oxford Film Festival, 2005). That film is a co-director favorite -- one of the few films that we all agree on -- and definitely a bonus to an already fantastic collection.